With many years combined experience in national press, consumer magazines and regional press, we offer a fantastic breadth of knowledge and have a very keen buying power across the range of titles. The key to successful advertising in press is making sure the fit is right. Correct targeting, without wastage, is critical, choosing the right titles for your brand at the right price so gaining a good ROI. Drawing from experience and industry knowledge we are well placed to make sure all this works in such a vast marketplace of press and magazines. With our media contacts and a clever strategy across both planning and buying we will deliver what you require for that successful campaign. British press has come a long way since the first newspaper the ‘Corante’ was published in London in 1621. The UK is now home to thousands of press titles, which provide an excellent platform for advertisers to promote their businesses and brands on. Newspapers are popular with people of all demographics, with 68% of adults reading newspapers every week. 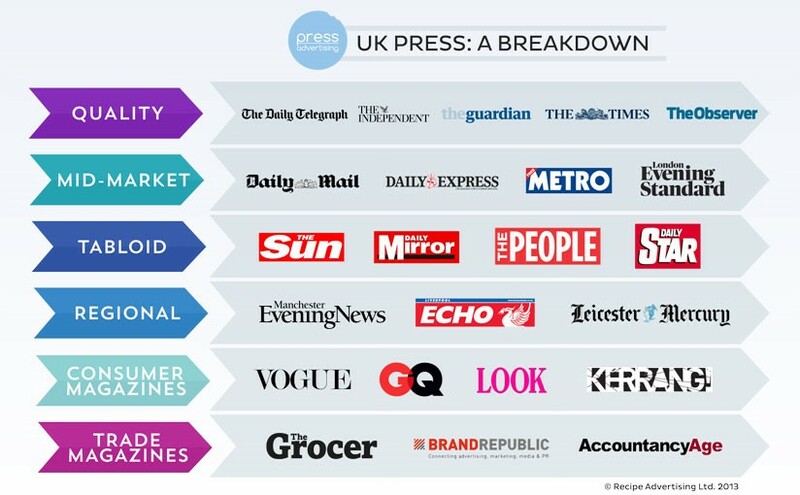 The UK press market is split into various types, all of which can be beneficial for advertisers. Here are some examples so you can see how things are broadly categorised. Print advertising accounts for about 25% of all advertiser spend, which equates to roughly £16 billion. Nevertheless, the changing media landscape has resulted in print advertising spend declining by roughly 50% in the last 10 years, as online and social platforms continue to develop and command high advertising investment. In order to adapt to the changes in consumer behaviour and to protect their brands, most newspaper and magazine titles have online sites that run alongside their printed content. The industry has now recognised this and has started to measure overall brand readership, and not just the figures for the printed titles alone.